Let's start this week with something simple, local and very affordable. Sigh! I must admit, I am missing Malaysian food a lot - all I get here is risotto, pasta, prosicutto ham, cheese and etc here. If it is nice I don't mind sacrificing rice and etc but some items are so dissapointing.The rainy weather is not helping though as everything is dreary - in fact, I spent the whole afternoon trying to snap pictures in the rain and it got so heavy that I was soaked to the bone. Okay, back to local food, which is always the best in my opinion!! I read about this place from ling239's blog and decided to check it one day. Was glad I did as it serves affordable and pretty decent food here. 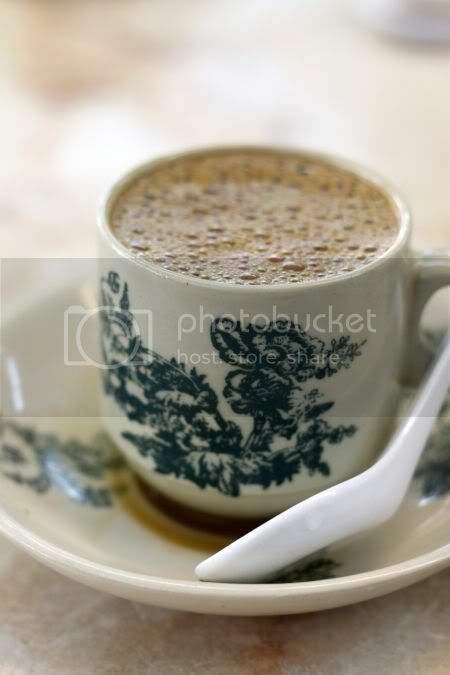 I love the white coffee here, it is the closest thing to the mind-blowing version they serve in their Ipoh oulet probably because they use the same coffee powder. The layout of this place is a little weird; 2 shophouses with one being the corner, where one is occupied with tables and chairs, the economy rice people and a few stalls on the corner while the majority of stalls are next door. I've only tried a few places - the Western stall, the supposedly famous Imbi market porridge stall and the curry mee stall. 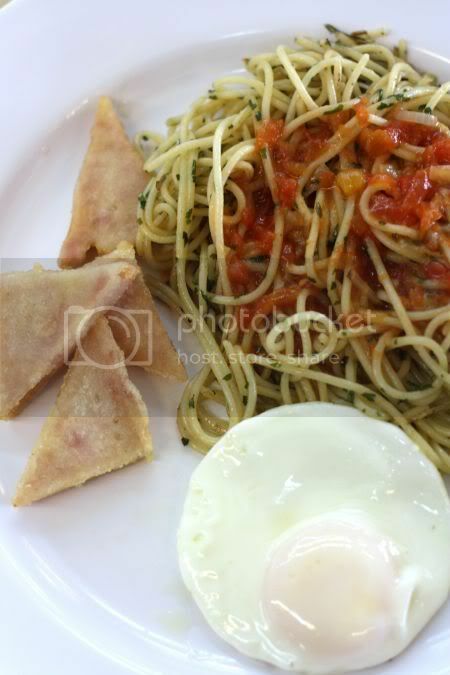 Generally, all were good - the fried spaghetti was al dente and aromatic since fried with herbs. They do a version with luncheon meat or bacon. The porridge place is also good - smooth porridge and noodles topped with very sinful crunchy intestines. I quite like the curry noodles too; topped with roast pork slices just like Ipoh. So, if you are around the area, drop by for great coffee. Flickr set has more also for all of you to see. Time to clear that huge backlog of blog posts I have. Better do them now, or else knowing me I will forget what the food tasted like. I'll start with the very memorable ones. My friends have been asking me to try this place for the longest time ever so recently I finally got a chance. Plus I was drooling from the descriptions in Malaysian Insider. Some may say this place can be pricey but I honestly think it is worth every sen you pay for it, as it is top-notch. We went a little crazy that night with our selections as my friend wanted to share her favourites with us. I doggybagged the food for my mother who really loved the food too! Always a good indication if it can excite my mother's palate who loves her Chinese food. 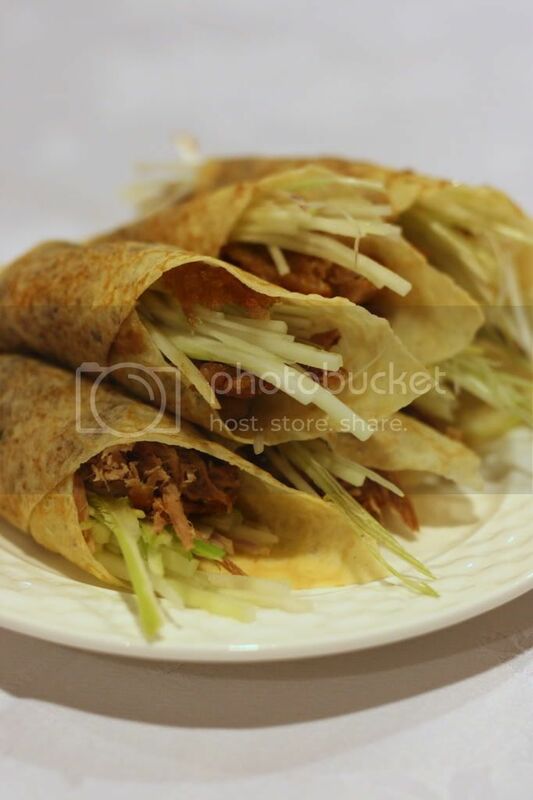 The aromatic duck pancakes were delicious stuff even though I only managed to eat a little and the bones were even better - so crunchy that I had to resist eating it all up. The fresh prawns with a creamy Chinese wine sauce was also good - we asked for a small one since we knew it will be impossible to finish. I enjoyed the vegetarian sweet and sour pork - made with beancurd sheets and it was so good with their fluffy fried rice with egg white. I was a little sceptical about the tomato noodles hence my friend also ordered the fried tung fun for me. The tung fun was simply fried with large dried prawns (har kau) and it was so aromatic that I have been hankering for it since. The verdict on the tomato noodles - it was also very good. A little tangy from the vinegar so the balance is not there but nevertheless since very good stuff. It reminded me of these tomato noodles from Sarawak but somehow this version is even better. And it did taste better the next day as the flavours seep it. I wanted to try out their steamed fish since it is a favourite of mine especially the bamboo fish (ikan bodoh in Malay and soon hock in Chinese) - really good, steamed perfectly and it even had the decadent fish liver. Yums especially with the sauce drizzled over rice. We also had the obligatory vegetable - jade green and crunchy kailan. 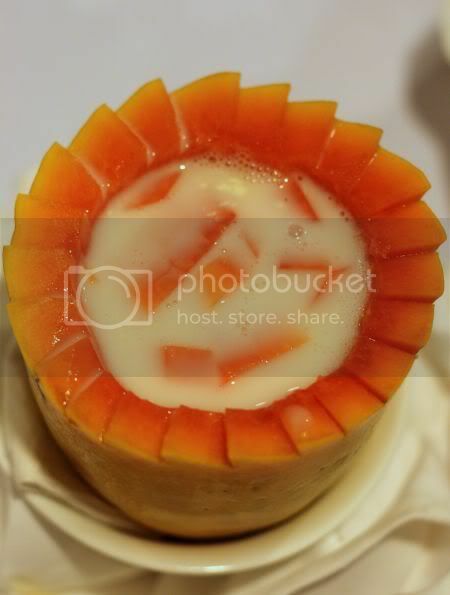 Last but not least, the warm almond milk in a papaya that Malaysian Insider raved about. 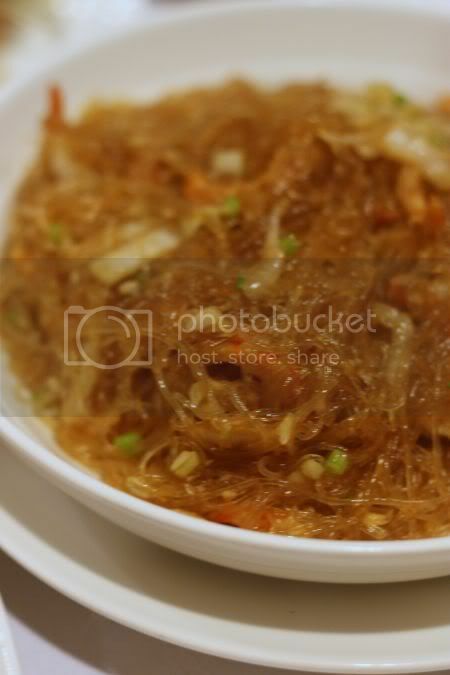 Very aromatic, not overly sweet with a bit of white fungus, I loved this too especially with the papaya. Overall, I didn't have any complaints about this place and I will definitely return as I want to try the lobster yee meen, I heard so much about. Plus those tomato noodles are addictive, I can imagine me running down town to pack that home and I suspect there won't be any leftovers to savour the next day. For all the pictures, see the Flickr set to drool over. A thousand apologies on abandoning the blog for a while. Been very busy and Internet access is not that cheap to get here (extremely different from the USA where it seems to be free!). Where's here you ask? Somewhere in Italy where it is a little chilly. Prior to leaving, I managed to upload pictures of previous food I ate so I'll continue to blog about that first instead. Remember the very much talked about cheap deal, Xenri D'Terrace was having? Well, we went and was very pleased with what we got there. Besides being great value for money, I also liked the set up of the place in Menara Hap Seng - less people so no need to jostle with others for food. I also did see people walk in and get impromtu seats when it was later i.e. a couple with their 2 kids who took over a group of Japanese around 1pm plus (it stops at 3pm). You still have this weekend (the last one of the month for the 50% discount to try!). 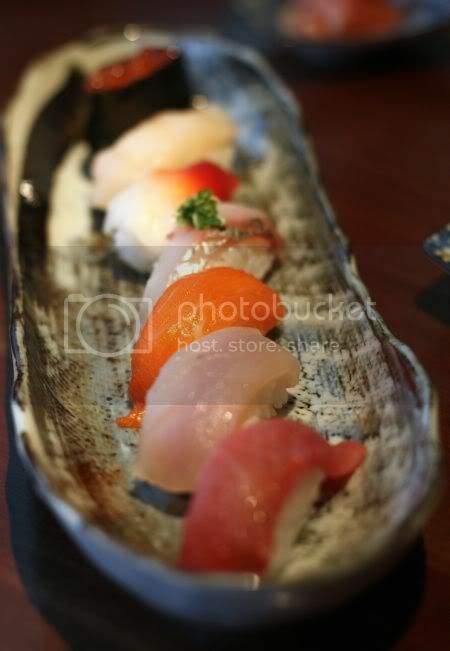 They replenish most of the food and you also can order from a list, a selection of teppanyaki and tempura items. 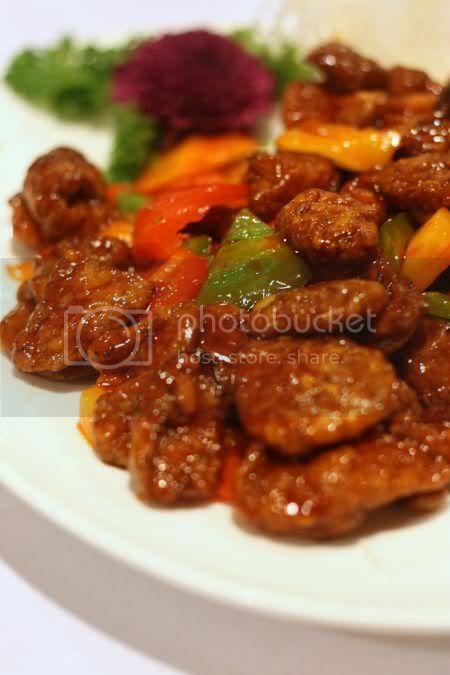 The food was great and we liked their selection - not too vast but just nice to keep both of us well satisfied. The fresh seafood section had cooked mussels, prawns, teeny weeny scallops, squid, fresh oysters with a large variety of sauces for you to choose to have them with - ponzu, chili sauce and etc. I had my fresh oyster with ponzu (soy sauce flavoured with yuzu juice) and it was very good stuff with the mild citrus taste. 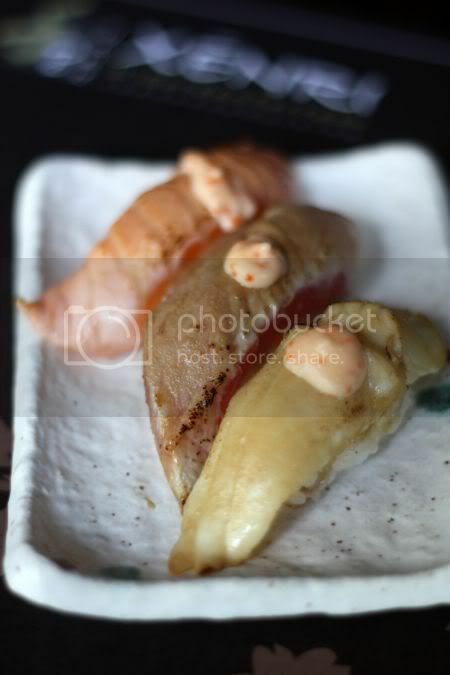 The sashimi and sushi section was also good - butterfish, salmon, tuna at the sashimi "boat"and various makis on the sushi section (we loved the cream cheese maki with a nice thick cream cheese within and the grilled fish versions as it gave a slight smoky flavour). You can also ask for handrolls - we had one with soft shell crab. There was a starter counter with all the Japanese pickles and their lobster salad made with mayonnaise. I didn't eat that, since it looked so fat laden with the creamy stuff but Splashie Boy loved that. 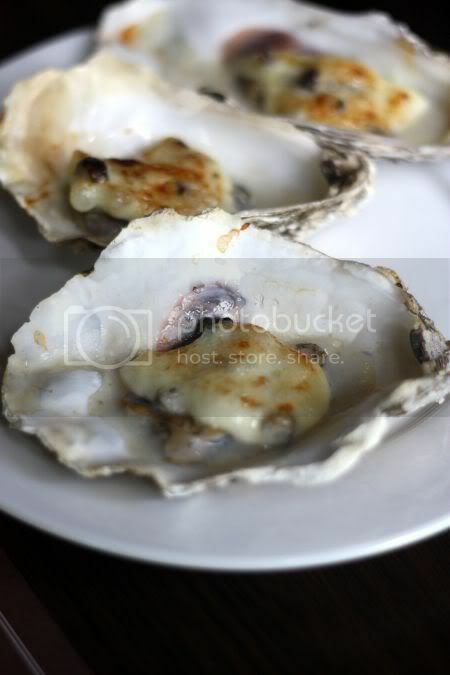 Other grilled and fried items were placed in hot plates to keep warm - I absolutely loved the grilled cheese oysters. Had so many that the girl at the next table stared at my plate - especially since I got them when they brought it out from the kitchen. There was a fried scallop with breadcrumbs which I thought was not bad (good for the kids, as they kept eating it), fried chicken, soft unagi, very juicy grilled salmon, saba, chicken teriyaki, chawan mushi and etc. Next to the sushi counter was the soup section - loved the kimuchi nabe, made with spicy kimchi, salmon head and crab. Very sweet soup and I had fun eating the salmon bones and crab. Splashie Boy had the beef sukiyaki, which was pretty good too. We also ordered off the menu - beef teppanyaki, which wasn't too great as it was a little tough but the mushrooms teppanyaki was nice. 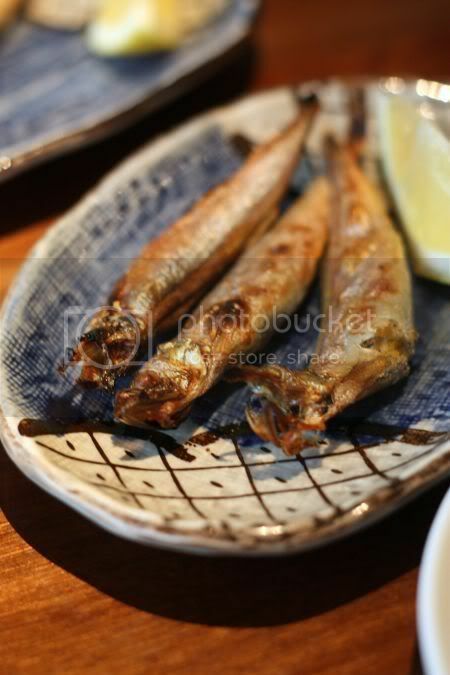 The shishamo was done tempura style here - a little salty I felt so I didn't enjoy that. 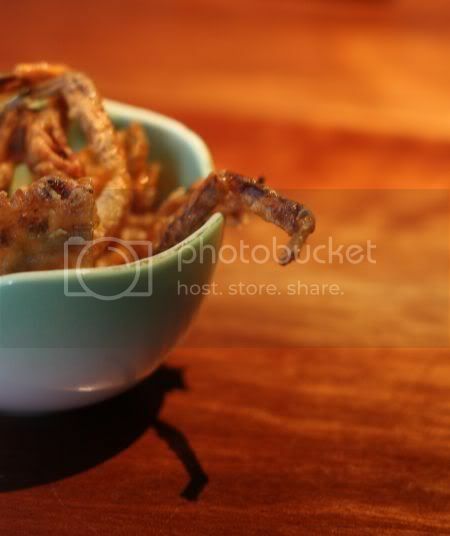 Soft shell crab tempura wasn't as good compared to the piping hot one from Mizu. Last but not least, desserts were very tempting and extremely pretty! No premium ice cream here (only Kings and from what I understand, the ladies loved the red bean as that finished ASAP!). Didn't like the green tea ice cream as the taste was flat and lacked any of the bitterness taste I crave for in my green tea ice cream. I loved the pretty puddings ranging from a jelly shot with a lychee inside, the creamy mango and strawberry pudding, creme caramel shooters, kame jelly and fruits for those who don't crave sweet stuff. 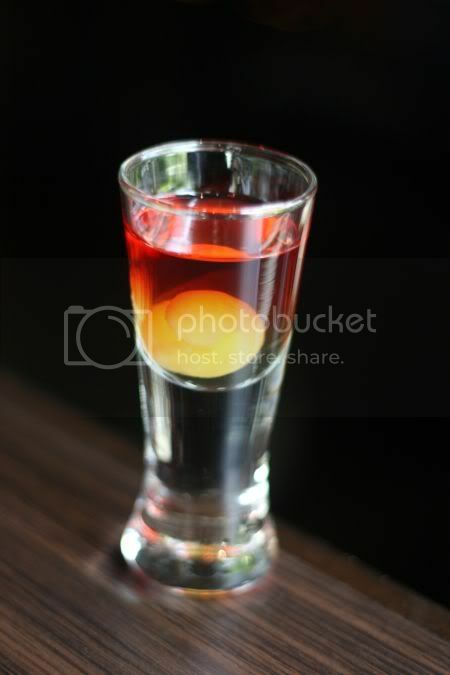 Drinks are also available so help yourself next to the dessert section. Overall view of the whole buffet, it was not too harried and you could eat at a leisurely pace since there was enough for everyone hence no need to queue! Even the Japanese thought it was a good deal as they came for it and ate loads. I guess times have changed also. Personally, I won't mind returning even without the 50% discount promotion as food was just nice for me. For a lot more on what we indulged in, see my Flickr set. Yikes, now I see the pictures, my tummy is rumbling for Japanese food but nope, it will be pasta, risotto, pizza, cheese, salamis and wine for 2 weeks! For more details on the Xenri buffet promotion, see my previous blog post on it. 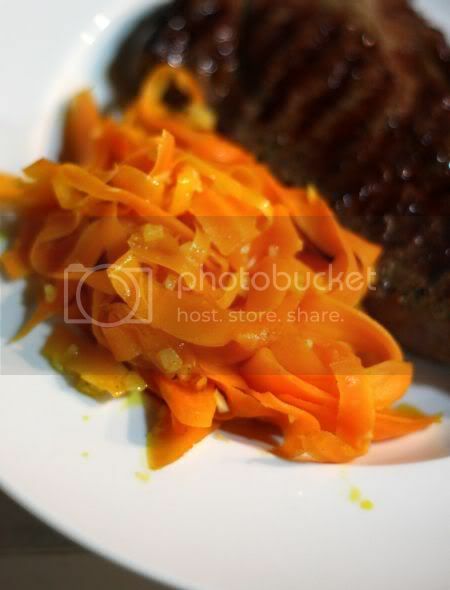 Cooking @ Home - Grilled Organic Steak with Saffron Carrot "Pasta"
When it comes to meals at home, I reckon the easiest meal is just grilling a steak. I recently bought a chargrill cast iron pan from Ikea (that great place, which sells the best deals in town) and have been obssessed with grilling food on it. Initially, I experimented with lamb cutlets and steaks but nowadays I am trying to change to a healthier tone by grilling fish instead. For instance, I just had grilled red snapper and button mushrooms on top of a nice meslun salad last night. What I love about my chargrill pan - the attractive ridges that appear on my food and how the flavour seems to seal in better. It needs very little oil (just a spritz on top of the meat or fish) and instead the oil drips through the ridges, so the items are free from soaking in the oil. Back to red meat, that sinful good tasting stuff. We love the OBE beef found at Village Grocer. Somehow, the meat is sweeter and less gamey. 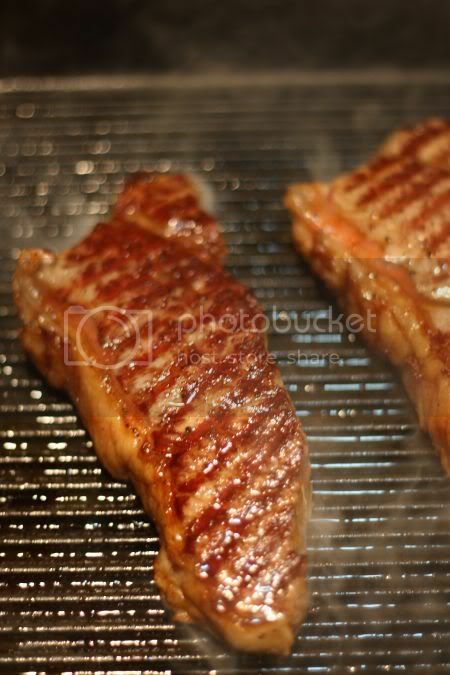 My belief for steaks, just spend the monies on a good cut or type and grill it at home instead of wasting monies in a restaurant. Nowadays, we have so many choices; Black Angus beef, wagyu beef (though not always grade 9 so be careful what supermarkets term as wagyu!) and organic beef. A good piece of meat really needs no expensive sauce but just a dash of freshly grinded black pepper and sea salt. With all that sinful stuff, I like to pair it with vegetables or a salad. This time I discovered the joys of David Tanis' famous saffron carrots. I love this simple yet flavourful way to cook carrots from his book, A Platter of Figs. Rather than cut them into "rounds", I like to peel them with a peeler to create a "pasta" effect. Do try the recipe as it is a doodle to make and very good. While saffron is pricey, the flavour is definitely worth it. Just imagine honey and buttery tones with a touch of citrus from the lemon zest - so damn good stuff you suddenly forget it is carrots aka the dreaded vegetable. A sweet but healthy filler for today. 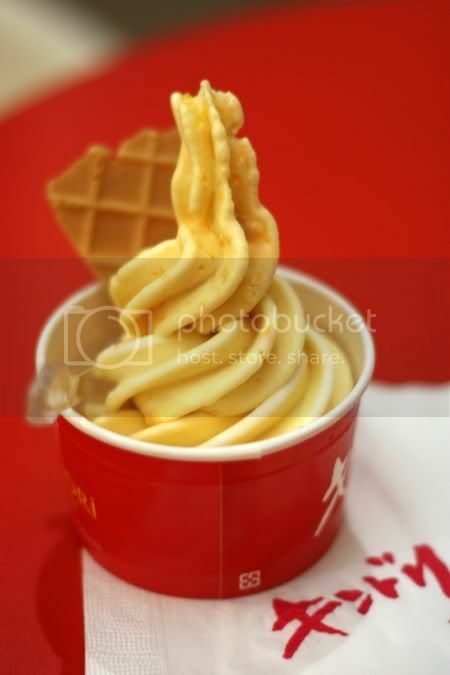 We had this creamy ice cream when we visited Papa John's ages ago. A Taiwanese innovation, it uses blast frozen fruits (said to help keep those good vitamins we need inside it) that are mixed up with milk to form this creamy and soft ice cream, as and when you place your order. Personally I found the fruits taste not very distinct and subtle, which means it is au naturel vs artificially enhanced with preservatives and flavouring. We also had the banana ice cream that was a little stronger tasting. You get to pick and choose what kind of fruits you prefer and they also allow mixing two fruits together. If fruits are not your thing, go for classic chocolate and matcha flavours. Pricewise, it is not cheap and I remember paying about RM6-8 for this. Catching with friends over dinner is always more fun especially when the food is awesome. Last Friday (defying all odds that it was an unlucky Friday 13th! 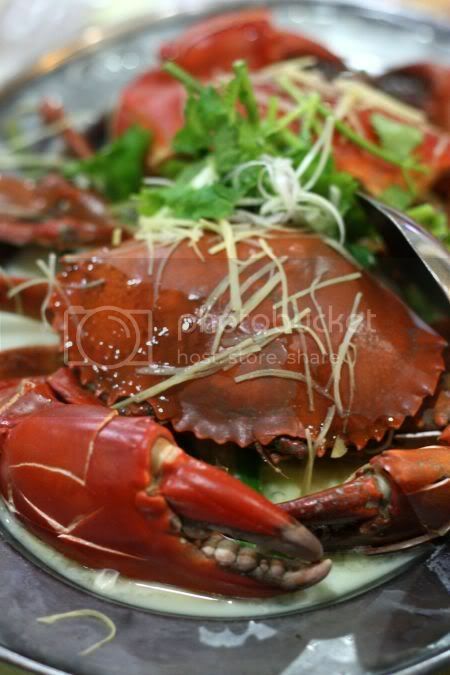 ), we all made it safely to Robson Heights Seafood, chosen for its highly lickable salted egg yolk crabs. I was first introduced to these luscious crustateans last year by Lyrical Lemongrass who is a regular here. Perched on a hill, this place is easy to spot especially if you are chugging down the Federal Highway in one of its infamous traffic jams, where time stands still. Even though it was a Friday night, I made it within 1/2 hour from Shah Alam - a miracle indeed. The specialties of this place is not hard to spot, as the enterprising restaurant has them printed on their wet towel packets. Since I did do some research on this place (after some prompting by Precious Pea, who was hungry at 5pm! ), I ordered the pork ribs, which Kampungboycitygal raved about. 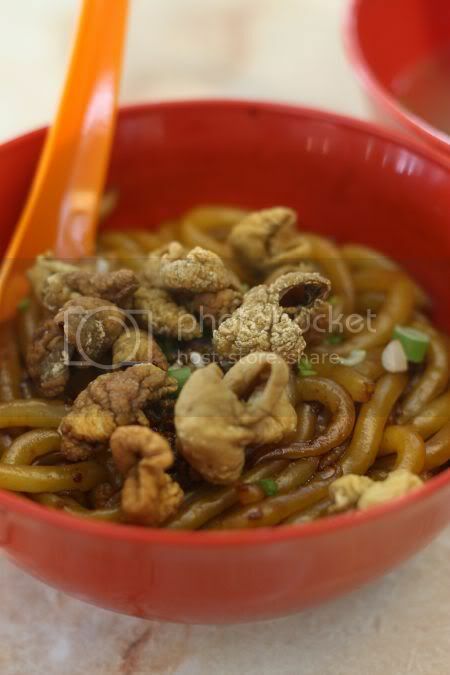 Also added the interesting sounding fried intestines with dried prawns. The pork ribs came in a jiffy (the kitchen is definitely super efficient here!) with meat that was falling off the bones. I felt it was just a tad sweet probably because we ate it on its own vs with rice. The fried intestines was a big dissapointment - not crunchy and lacked much taste even though they did laden it with lots of dried prawns and chopped green cili padi. 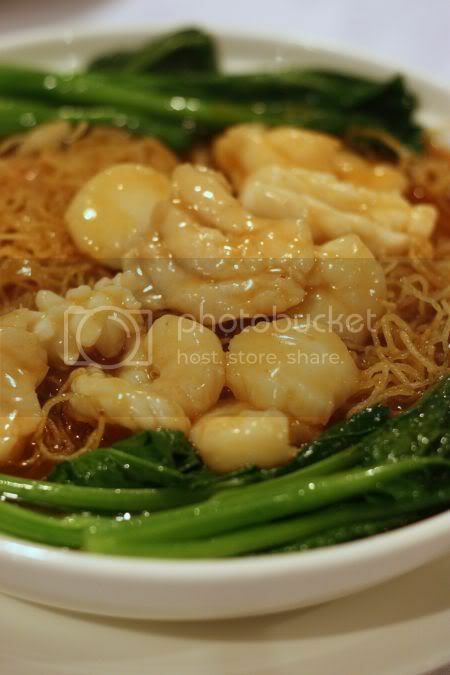 We got lucky with the claypot glass noodles with water prawns, which turned out to be the winner of the night. Usually, the norm is to order the black pepper udon and since it wasn't available, this was recommended by the waiter. 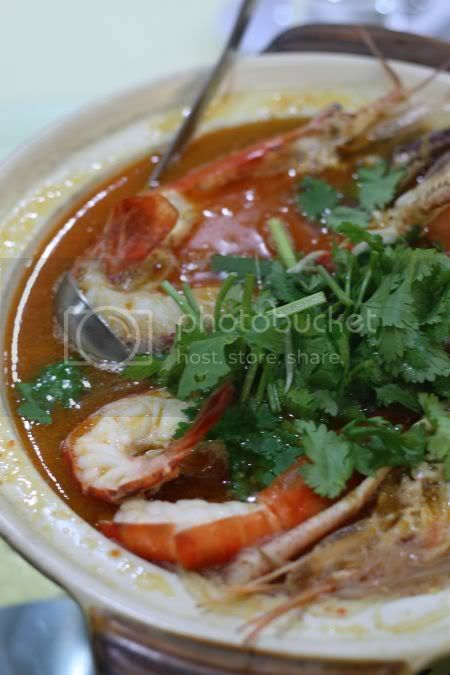 Filled with large water prawns (3 pieces sliced into 2 for the 6 of us), the soup was rich from the prawn roe making the glass noodles slurpworthy. 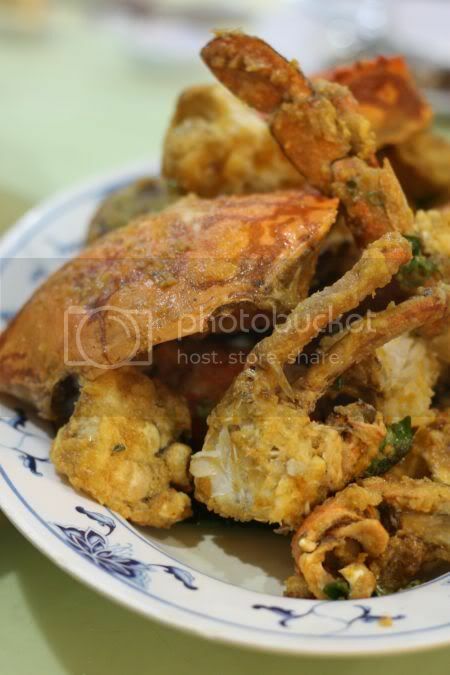 The crabs were the finale of the night with us attacking the very lickable salted egg yolk encrusted crabs. While the steamed crabs were large and sweet, it would have been better with more liquid vs egg as the crabmeat was a little dry inside. Nevertheless, it was a wonderful meal especially catching up with everyone. For more on what we demolished that night, see my Flickr set. Last weekend, since both of us was free to do some exploring, we decided to visit Kampung Pandan to try and locate this infamous place, which serves Negeri Sembilan food or masakan Nogori. I accidentally found out about this place from this blog. With the vague directions, we set off to locate it and surprisingly, it was pretty simple to find the restaurant. Although the place is quite simple, I was surprised to see they had an air-conditioned section. The restaurant is extremely popular with everyone including the rich and famous. We spied these bloggers there when we dined here (couldn't miss the camera action right next to us) and on Splashie Boy's second visit there, he spotted a Porsche Cayenne. According to Splashie Boy's colleague who lived around the area, the reference 911 in the restaurant's name is because when they first started out, there was a discarded police car parked outside the restaurant (911 was the old number to call police last time). However, after they expanded, they had to dispose it but the name 911 stuck. 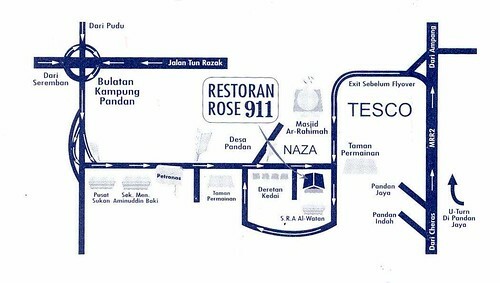 Usually people park around the restaurant but opposite the place is Kak Rose's residence, which also acts as a car park. What's good here? Well, almost everything we ate was very good including the desserts. 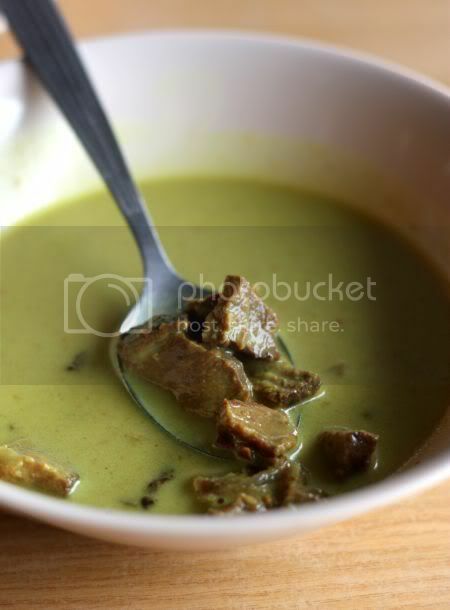 They do a really good daging salai masak lemak - tender beef pieces in a slightly spicy and coconut milk rich curry. Another famous Negeri Sembilan dish is the teluk itik masak lemak, duck eggs in the same kind of curry. 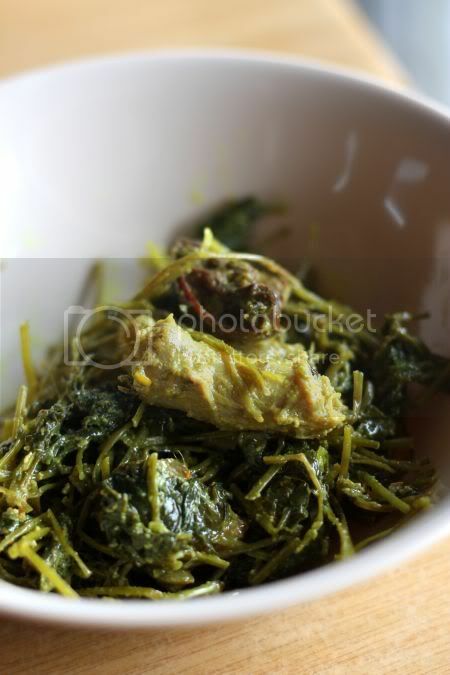 Then, I spied the unusual rendang pegaga, a mix of pegaga leaves and stems with chicken feet, gizzard and liver. Takes a while to get used to this dish. The tofu and ayam goreng also seem to pretty popular. I love the desserts here and couldn't resist getting a large selection for just the 2 of us. The lepat pisang tasted like bananas vs those ones you get that taste only of flour! 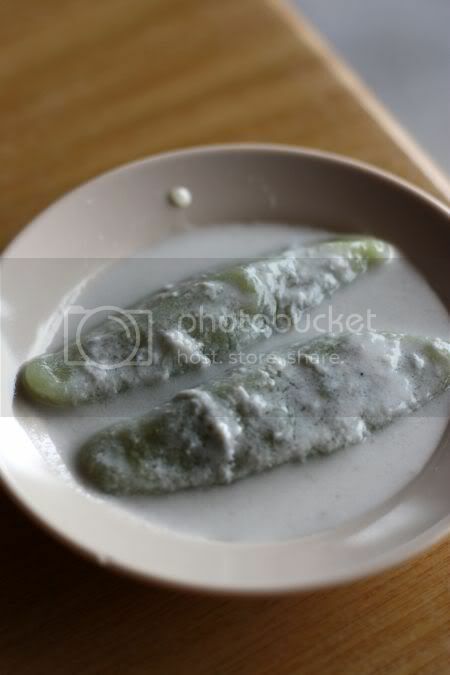 Another must-have is the badak berendam or literally translated as sunken hippos. They're actually dumplings filled with grated coconut with gula melaka; absolutely heavenly stuff. We also had tapai that was pretty good too. Prices are also very reasonable, for the amount of stuff we ate, it only came up to RM20 including extra orders for drinks. I'll definitely revisit this place again for their food and also to try the other dishes. For more on what we ate, see my Flickr. 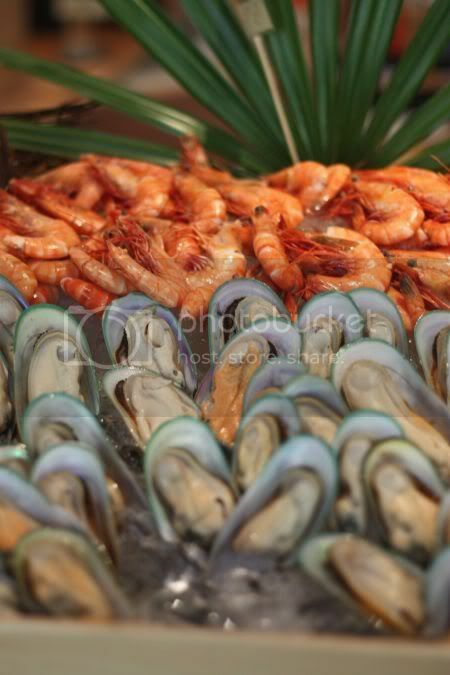 claw your way here for a relaxed buffet.. The long weekend was a great break, we caught up with friends and family for very long lunches and dinners. Filled with lots of great food and fun, I reckon I have enough to keep all of you entertained for quite some time. Before I launch into today's review, I received a nice update from Sunny Lim who informed me that Krispy Kreme fans don't need to wait long. The first outlet in Berjaya Times Square should be rolling out its first sweet and sticky glazed doughnut next month. Can't wait to go try the sugar laden goodie even though I'll be away for the first week of April. 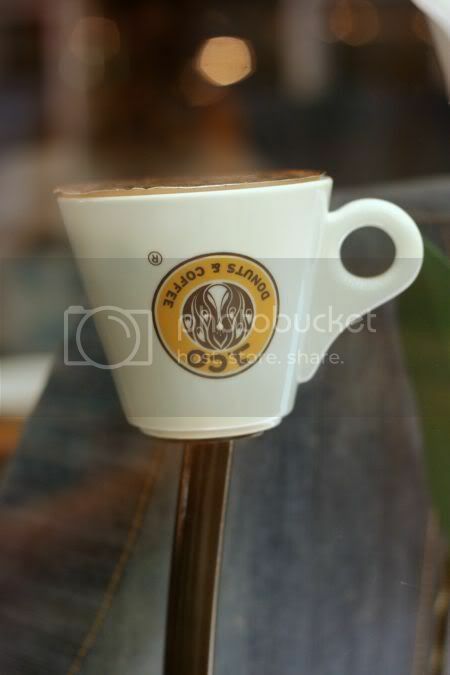 Klue's website, hence I asked the people in Bangsar's Mizu, what it was all about. The sushi buffet is on for Sunday (lunch and dinner) and unlike the other places in town, here you pick what you want from a list of items. It reminds me a little of Iketeru's buffet also but unlike Iketeru no limit on how many orders you place at one time. Priced at RM100++ per pax, not a lot of people are queueing up for this buffet and surprisingly the people patronising it are the Japanese. When we dined here, we only saw 3 tables ordering the buffet and we were the only locals. The start you off with the first course and the 2 most expensive items - toro (tuna belly) and uni sushi, which can only be ordered once followed by the soup of the day. Then it is up to you to select from a list of items that range from snacks like edamame, a large variety of makis (handrolls or cut ones), vegetables, grilled items, sashimi, tempura items and etc. Seperate pieces of paper will be given to you to fill up what you like for nigiri sushi (chutoro, maguro akami, toro binchou, kanpachi, madai, shime saba, sake aka salmon, sake harasu tataki, aori ika, hokkigai, tako, ebi, nama hotate, kani kama, amaebi, akagai, aji, kinmedai, hirame, hamachi, mekajiki, mentaiko, unagi, tamgo, inari, shime kohada, ikura, negitoro and tobiko). We had a lot of food since there was 3 of us eating - shishamo fish with its cholestrol laden eggs, loads of buri (a type of yellowtail) sashimi, salmon sashimi, salmon carpaccio, makis, grilled cod, oden, fried beef, deep fried oysters, unagi and etc, etc, etc, etc. To view our gluttony, see the Flick set. The verdict on this buffet - it is good for those who like to relax rather than fight with people or queue up for their food. Here you order in a leisurely style and also eat in an easy pace. However, the list that you have to choose from features only the dish's name and its Japanese name, so those unfamiliar with Japanese terms will be very confused and find it difficult to order unless they keep asking the wait staff. Freshness is definitely better here with grilled and deep fried items delivered straight to you after it comes out piping hot. The price of it will also deter a lot of people but considering the first course of toro and uni sushi will already set you back for RM50 here, it is still a good deal. While most of the items were fresh, one item fell foul with us was the binchou butsugiri as it was a little too soft and flaky for our liking. Another thing we didn't like was communicating with the service staff especially getting a booking was very painful as they don't seem to understand English very well. Note also they seem to give you an extensive selection for nigiri sushi and makis vs sashimi; I reckon this is just to fill up your tummy quickly with rice. Log on to your Facebook and join the sizzling hot club in the Klang Valley & beyond - Fatboybakes Fan Club. To honour this kind and generous soul who churns out delectable treats , click on THIS LINK. Pssst, there is talk of t-shirts and gatherings also, so what are you waiting for? 1. He blogs under Have Your Cake and Eat it Too, where he dazzles us with his wit. 2. 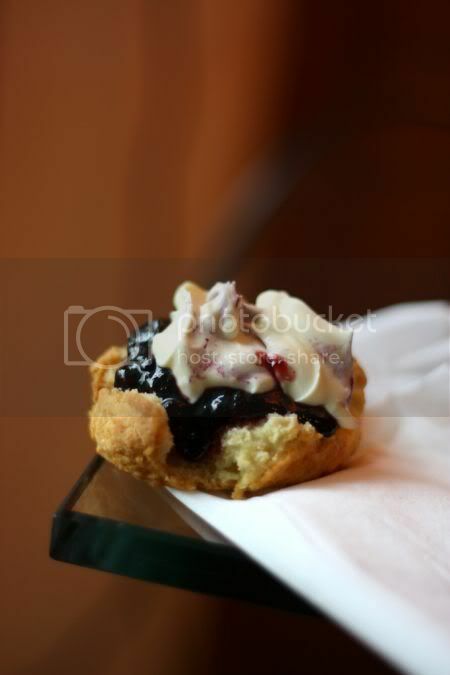 He also blogs under Fatboybakes' Fattening Favourites, where you can view every delectable treat from his kitchen. 3. FBB is a devoted husband. 4. He is a proud daddy to 4 beautiful kids. 5. FBB throws legendary parties filled with yummy food, alcohol and lotsa fun. 6. He is a lover of fine wines, champagne, whisky and alcohol. 7. FBB is a learned man with an MBA under his belt from Universiti Malaya. 8. He loves to bake even though it has absolutely no relation to his current profession. 9. He loves good food no matter where they serve it. 10. You can often find him working out the calories consumed in the gym. 11. He is part of the Daring Bakers, a group of souls from all over the world who take on amazing baking feats and monthly challenges. 12. He has a civil engineering degree from the University of Sydney. 13. FBB loves music especially musicals. 14. He has met up with Bobby Chinn twice. 15. He was one of the first food bloggers I met long long ago. 16. He was born in Taiping. 18. FBB loves black sesame ice cream, with the best being in Isthmus, Northpoint. 19. He can never resist a plate of Hokkien fried mee especially one laden with fried lard. 20. He writes for My Nourishment magazine. 21. He must have a cold shower every morning. 22. He used to teach English part time in Robert Lam English Language Centre. 23. He loves Coldplay Viva La Vida. 24. He is a man of many "talents" and used to be a part time copywriter in an ad agency. 25. He makes the lightest scones ever (a million times better than the rock hard scones from Harrods @ Suria KLCC)...see below. gorgeous scones that beat even famous English ones from Harrods..
For those who thought about the riddle or more like the puzzle, the answer is Roasted Bone Marrow. Nic who recently had this in Singapore, managed to guess what the rings were - emptied bones after the marrows have been dug out. Big pat on his back! We found bone marrow selling in delicious ingredients at Dua Residency, hence we bought them and decided to have a very decadent meal at home. These sinful fellas (also known as Anthony Bourdain's last supper, after he ate at Fergus Henderson's restaurant St John) is usually paired with a parsley caper salad per Henderson's recipe. Mine was just based on the Christmas issue of Appetite. 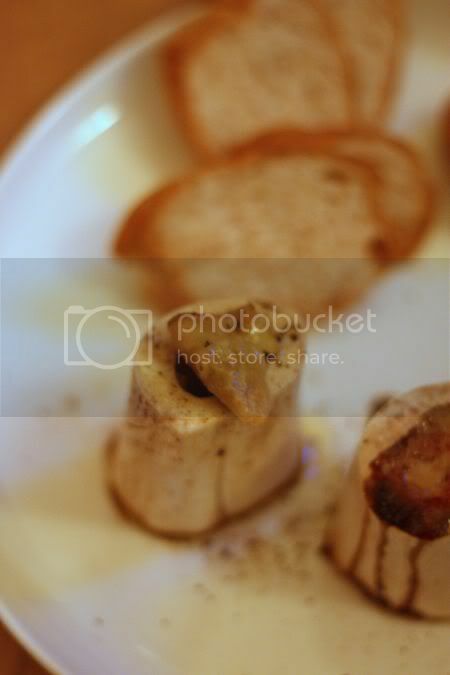 I even came across an even more decadent recipe from Michael Ruhlman's blog - fried bone marrow! That sounds very good but a little more work. Am not sure if delicious ingredients still stocks this and whether you can get them from the butchers though but I would think it is possible, since I see sup tulang places having this around. Preheat oven to 180 degrees C. Clean and wash bones, place on a foil lined baking tray. Bake for 10 minutes. Remove from oven (beware as the bones are hot), place on a plate and season with black pepper and salt. Serve with toasted baquette slices and eat while hot. Serves 6. Let's shake up the week with something different - little notes on dining related news and a riddle for all of you, especially dedicated to those whose brains are rotting away in the office. 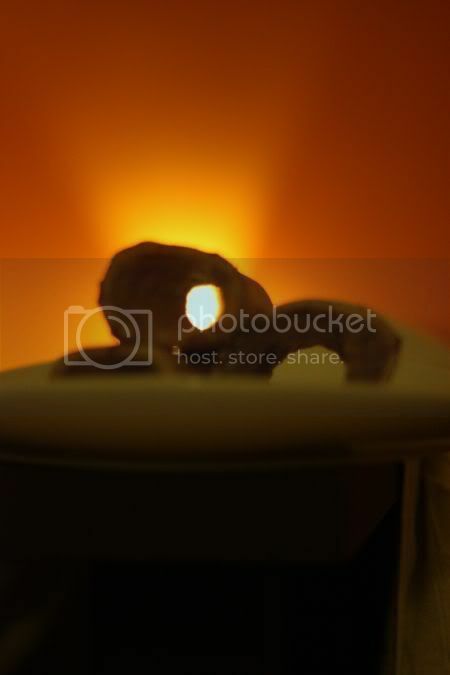 Time to crack those brain cells, people and guess what is the picture all about???? No prizes though since I don't have any sponsors but give yourself a big pat on the back, if you scored correct. Saw that Maredos Steakhouse in Bangsar has closed down, replaced by a interesting named place - Banana Jones. Looks like a banana leaf rice joint, hence I guess the banana reference. Not sure where the Jones part came about unless Indiana Jones aka Harrison Ford is a shareholder? Red Ginger at Plaza Damansara is also gone (I think the one at Northpoint is still around) and replaced with place called Daddy Kitchen. The char kuey teow man in Restoran Seng Lee, Damansara Heights has re-located to Section 25, Shah Alam. Instead, his daughter has taken over the Damansara Heights' stall. Heard that Cilantro will re-open end of the year, after Micasa finishes their renovations. No one knows what is going to be the arrangement since Sage is now opened and Takashi helms the Chef's Table every night. I guess we will have to wait and see. WIP in Bangsar Shopping Centre closed on 22 February, with a lot of fanfare - they're shutting down to renovate the place (the whole side of that wing has also closed for renovations) as it seems they found their concept. Enter the contest to name the new WIP and win a free dinner for 4 pax. Seems Il Divo of Desa Sri Hartamas is moving to Ampang soon. I guess works are in progress as on Monday, the Italian joint was closed. Sounds like bad news for Desa Sri Hartamas as it has been quite quiet there ever since Solaris opened their doors. Read that Prive, that hot place in Singapore is opening an outlet at the GTower in Jalan Ampang sometime in the fourth quarter of 2009. From their website, it says that the restaurant will be on the 28th and 29th floors. It also includes an al-fresco rooftop lounge called Modern Alchemy. Sounds like it will give Skybar a run for their monies? Also found while flipping through the pages was the news that we can expect a new Italian joint by Paolo Guiati, the guy behind Nerovivo around Changkat Bukit Bintang in the very near future. And finally, from now on, there will be a change to how we dine i.e. book ahead to earn points! The Qguides has launched their online booking system, which I had the privilege to beta test last week. A boon for those who hate to wait at the phone, the online system will work with SMS and email confirmations. Believe me, it works as I tried it out last week as long as you book at least 30 minutes ahead. Best of all (for all of us who love great bargains!) they do a reward system - book with them and get cash vouchers back. At the moment, they have 20 restaurants and hopefully more will jump on board with them. It is definitely a very revolutionary idea and it disciplines us to plan ahead (something I rarely do I admit) but with freebies as the dangling carrot, I may change my mind and join the club. 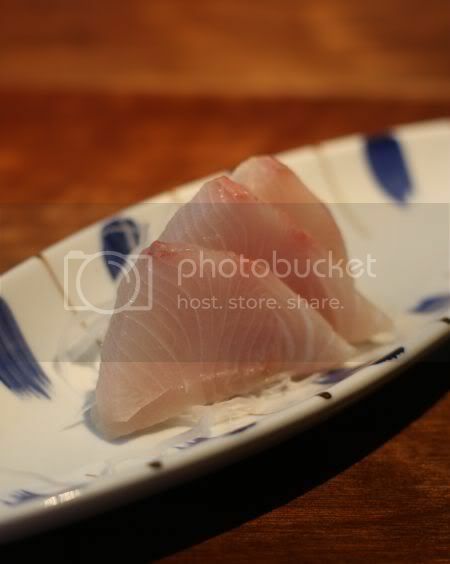 The site also carries a list of places to eat, nicely segregated to different types of cuisines. Something great for foodies, as it will be a source for information even though it is not comprehensive. 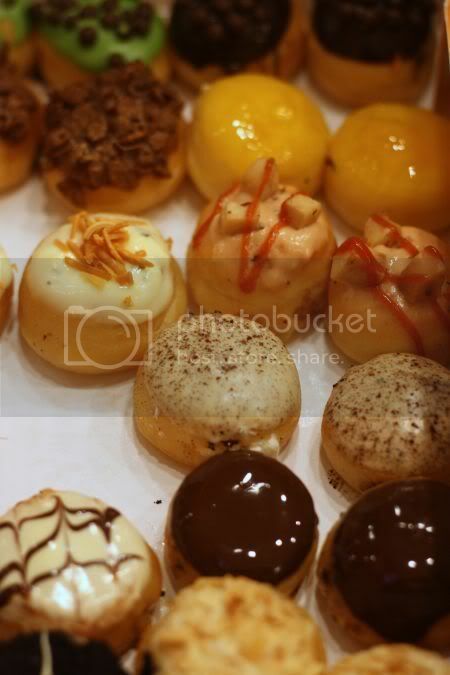 Seems appropriate yesterday's post was all about Krispy Kremes, that I blog about doughnuts today! Been busy running around doing errands that I must admit, I haven't had time to check out new places. Spied these last night when we were doing a quick spot of grocery shopping at Giant. The place is very very quiet during the weekdays....almost deathly quiet, wonder how some eateries are going to survive? The craze for doughnuts have definitely waned at late - you can get Big Apple Donuts everywhere you turn and J Co Donuts have lost their appeal to those who used to queue for it. I honestly am not sure how Krispy Kreme will fare in this kinda environment. Maybe people will queue up initially but with the availabilty of the other brands around, I can imagine their patience to wait will definitely dissapate quickly in thin air. 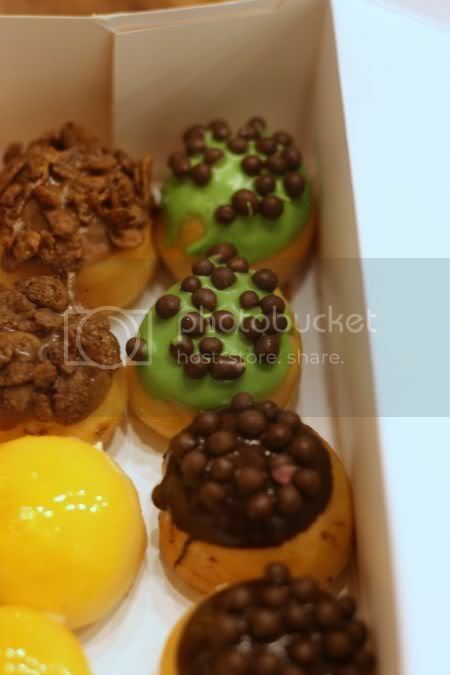 J Co Donuts recently introduced these baby doughnuts known as J Pops. Similar to Dunkin' Donuts' Munchkins, these are the doughnut holes. Unlike those gaudy decorated Munchkins, these are actually miniatures of the actual doughnuts with the same decorations. The J Baby Pops are available in a box of 24 for RM18 (including tax) and has 12 different flavours; Al Capone, Coco Loco, Mango, Tira Missu, Caviar Choco, Caviar Mint, Heaven Berry, Why Nut, Cheese Me Up, Mona Pizza, Oreo and Crunchy. 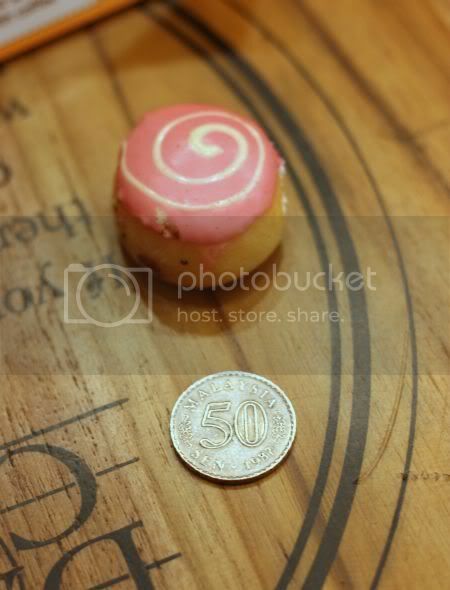 As these are tiny, slightly bigger than a 50 sens coin, you don't get that crazy sugar rush with a normal J Co donut with a baby pop. However, they can addictive so don't eat them in one sitting or share them around or you will be bouncing off the walls with all that sugar! Mention fast food and Splashie Boy's ears will prick up. He's the fast food freak among both of us and won't hesitate to eat it the whole week, if he had a choice. Thus, when it came to deciding where to eat last weekend, he picked Papa John's, the pizza place he has been dying to try out. Another of Berjaya's new franchises (they also have Wendy's), currently the only outlet opened is in Berjaya Times Square. Next should be IOI Puchong. I was sceptical at first but hold on, the outlet was packed to the brim with people that afternoon! Kinda gave me hope, as honestly I wasn't impressed when I saw the menu. I was keen to go all out for unusual i.e the Texas Heat, which sounded very promising with jalapeno peppers, green peppers or capsicums and beef bits. However, Splashie Boy wanted the Super Pizza, hence we compromised and went for the All the Meats. While waiting, I was busy reading on Papa John's. 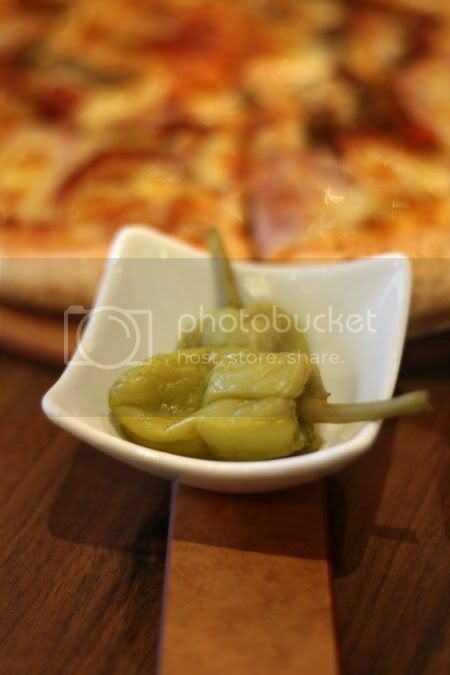 Their tagline, "better ingredients, better pizza" is said to be due to them using fresh dough and unlike the boring run of the mill pizzas, here they serve these green pepperonici peppers and a garlic sauce dip with the thick crust pizzas. don't throw away the crust, use it to dip into the garlicky butter sauce - warning though, it is very high in fats and cholestrol! I loved the not very spicy but tangy peppers, wish they gave more as they were kinda addictive. 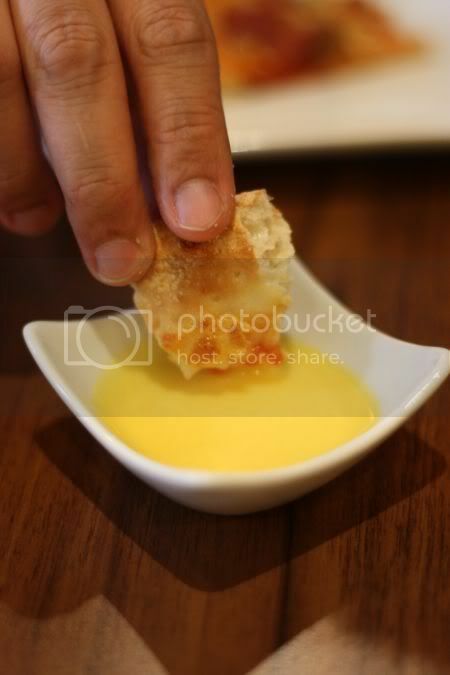 You dip the crust in the garlicky butter sauce or drizzle it over your pizza. Drizzling doesn't seem to work as it clashes with the flavours but the crust dip thing works fine for me. 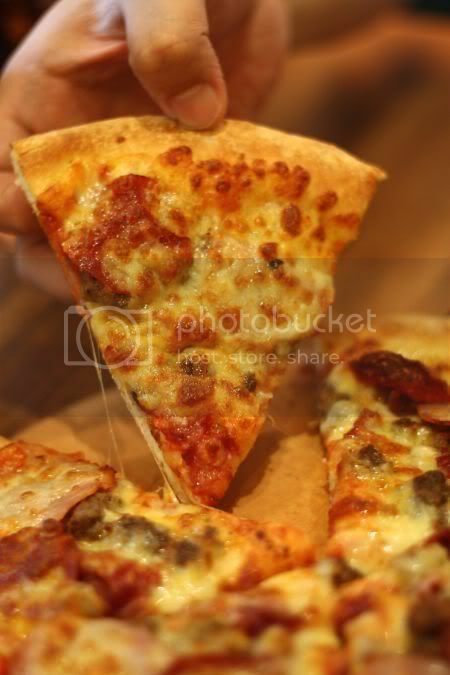 Surprisingly, the pizza is actually very good stuff (definitely beats yucky Pizza Hut hands down!) and tasty. Not as fantastic compared to Italian made pizzas but definitely one of the better fast food pizzas I have eaten. 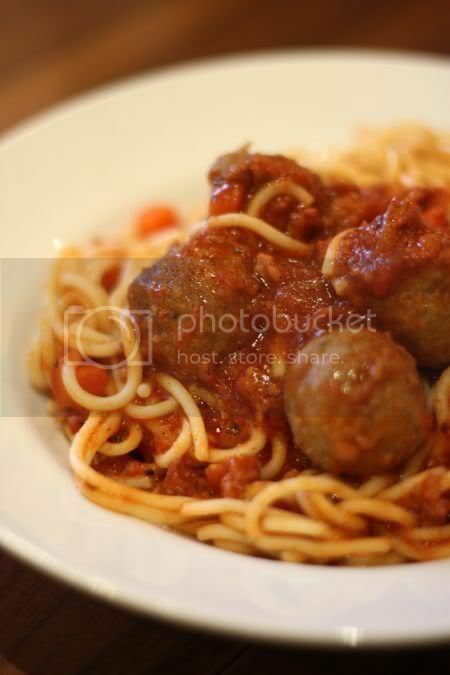 We also ordered a pasta dish (they have pastas, baked pastas and even baked rice dishes) - the Beef Balls Bolognaise. The sauce tasted quite good - no sour tomato taste and filled with lots of minced meat and diced carrots. Meatballs was also tender and not dried out. Only bummer was the pasta was way over cooked and too soft. Guess someone got overzealous in boiling the pasta away!